Virgin Galactic’s SpaceShipTwo rocket plane exploded and crashed during a test flight on Friday, killing one crew member and seriously injuring another, authorities said. The Scaled Composites Model 339 SpaceShipTwo explosion came after the plane dropped away from its WhiteKnightTwo carrier airplane and fired up its hybrid rocket engine, said Stuart Witt, CEO and general manager of the Mojave Air and Space Port in California. The blast scattered debris across a two-mile swath of the desert floor north of Mojave, which is about 95 miles (150 kilometers) outside Los Angeles. "We hope that the survivor will be just fine," Youngblood said during a news briefing. The pilots have not yet been identified, but both of them worked for Mojave-based Scaled Composites, according to Scaled's president, Kevin Mickey. Scaled has played a key role in developing and testing SpaceShipTwo for Virgin Galactic. Virgin Galactic had planned to use this SpaceShipTwo to fly passengers on suborbital trips to the edge of space, beginning as early as next year. A nearly identical rocket plane is already under construction inside a Mojave hangar. More than 700 customers, including celebrities such as Ashton Kutcher and Justin Bieber, have paid as much as $250,000 to take a ride. SpaceShipTwo's crew was testing the rocket engine in flight for the first time in more than nine months. The plane was slung beneath WhiteKnightTwo for takeoff from the Mojave Air and Space Port at about 9:20 a.m. PT (12:20 p.m. ET). When the paired planes reached a height of about 50,000 feet, about 40 minutes later, SpaceShipTwo was released for the test. Witt said the anomaly occurred about two minutes after SpaceShipTwo dropped away and fired the rocket engine, but he didn't see any explosion. "It wasn't because something did happen. It was what I was not hearing and notseeing," Witt said. Photographer Ken Brown, who was covering the test flight, told NBC News that he saw an explosion high in the air and later came upon SpaceShipTwo debris scattered across a small area of the desert. The WhiteKnightTwo plane and its pilots, meanwhile, landed safely. Authorities cordoned off the crash site pending an investigation. A National Transportation Safety Board team was expected to get to the crash site Saturday morning. The Federal Aviation Administration said it was also investigating the incident. Mickey said he expected that the investigation would take several days. One of the two test pilots aboard the plane was killed, said Kern County Sheriff Donny Youngblood, who was among the officials dealing with the crash's aftermath. The other parachuted to the ground and was injured. That pilot was transferred to Antelope Valley Hospital in Lancaster, California, according to Kern County Deputy Fire Chief Michael Cody. 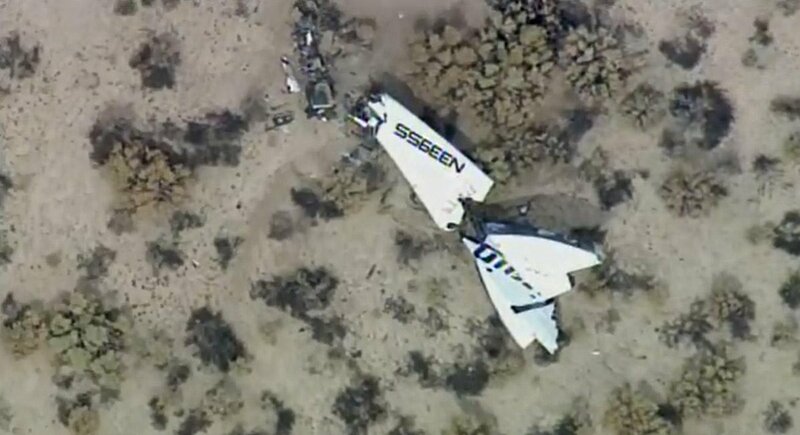 Credit: Image from video by KABC TV Los Angeles shows wreckage of what is believed to be SpaceShipTwo in Southern California'son Friday, Oct. 31, 2014. The explosion of Virgin Galactic's passenger rocket is stirring up mixed emotions as scientists and others involved in the space industry wait for more details on what happened over the Mojave Desert on Friday. — Former NASA top space scientist Alan Stern has seats to fly on Virgin Galactic — and its competitor XCOR aerospace. He isn't rethinking plans to fly in space at all. "Let's not be chicken Littles here," said Stern, now a vice president at Southwest Research Institute. "The birth of aviation was also a very dangerous time period." "All forms of transportation carry risk," he said. "To expect spaceflight could somehow be different is unrealistic on the part of the public or anyone. Secondly to do something very hard, to do something on the frontier, comes with risk." — Eric Stallmer, the president of the Commercial Spaceflight Federation, offered his sympathies to the families affected by the explosion. "Today, we are tragically reminded of the tremendous challenges that we face every day in our efforts to push the envelope of human experience and capability in space enterprise and exploration," he said. Stallmer and Bill Nye, chief executive of the Planetary Society, said the courage of both pilots and the commitment Virgin Galactic has made to space tourism will serve as inspiration as the industry continues to make space travel as safe and reliable as possible. — Former NASA astronaut Jerry Linenger, who nearly died in a 1997 fire aboard the Russian space station Mir, said when he first met British billionaire Richard Branson, founder of Virgin Galactic, he told him the first thing he'd have to worry about is liability insurance. "You will have setbacks," Linenger said he told Branson. "That is a reality." — In New Mexico, from where Virgin Galactic planned to launch its tourism rockets within the next year, hearts were sinking. The New Mexico Spaceport Authority issued a statement saying it was sending its thoughts and prayers out to the crew's family members and the team that has been working for years to develop the rocket. "We will continue to work with and lend our support to Virgin Galactic through this tragedy and in the coming months as we move forward," the authority said. Several people expressed sadness that one pilot was killed and another was seriously injured, many also said they understand the risks that come with pushing the boundaries that have hampered the burgeoning commercial space travel industry.